The unidentified suspect in a police photo taken on August 29. 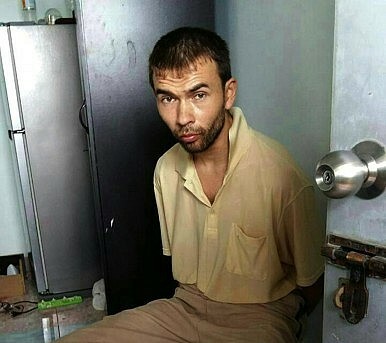 On August 29, 12 days after a deadly bomb blast at Erawan Shrine in Bangkok, Thai police announced that they had arrested a suspect. Twenty people were killed and over 100 were injured in the bombing. On Saturday, Thai authorities arrested a 28-year-old man described as a “foreigner” at an apartment building in the Nong Chok area of Bangkok. Police said that they found materials that could be used to make a bomb inside the suspect’s apartment, including metal ball bearings of the same size as those used in the August 17 explosion and a detonator. Col. Noppasit Sithipongsophon, who led the search of the suspect’s apartment, told Bangkok Post that the man was “definitely involved” in the bombing. Police also discovered multiple passports in the apartment, including one Turkish passport that was obviously a fake (reporters who saw the passport said that the expiration date was printed twice and that the word “Istanbul” was misspelled). Though authorities have not officially confirmed the man’s name or nationality, Thai media are reporting that he is Turkish, citing anonymous police sources. In addition to carrying a fake Turkish passport, Bangkok Post reported that a Turkish-speaking interpreter was brought in to help the police question the suspect. In the aftermath of the bombing, police released a sketch of a male suspect, based on security camera footage of the shrine before the explosion. That man, seen wearing a yellow T-shirt and leaving a backpack at the shrine was considered the main suspect.The man arrested on Saturday may not actually be the man seen in the camera footage, according to the Bangkok Post. Instead, police sources said that he is believed to be one of a group of three people that helped to plan and coordinate the bombing at Erawan Shrine, as well as another bomb attack at the Sathon pier on August 18. Thai police have since announced that they are seeking two additional suspects: a female Thai national, identified as 26-year-old Wanna Suansant, and an unnamed foreigner believe to be in his 40s. According to The Nation, police said that they had found fertilizer and explosives in an apartment being shared by Wanna and the unnamed foreigner. The various connections to Turkey are adding fuel to the rumors that the August 17 attack was perpetrated by ethnic Uyghurs, possibly of Turkish origin, who were upset by Thailand’s decision to deport 109 Uyghur to China earlier this summer. But Thai authorities remain quick to dismiss the idea that this attack is linked to international terrorist groups. Police spokesman Lt. Gen Prawut Thawornsiri said that police were investigating all possible motives for the crime. One possibility, Prawut said, was that the bombing was “an act of personal revenge” after police broke up a passport counterfeiting ring earlier this year. Prawut said the suspect was not cooperating and that police had yet to determine his real name. When reporters asked Thai Prime Minister Prayut Chan-o-cha on Friday if the bombing was related to the Uyghur deportations, he said, “Possibly. But all [explanations] were possible.” He added that the bombing “might be related our own problem or related to a smuggling movement.” He also urged media outlets not to speculate about the case, lest they complicate the on-going investigation. Official: Indonesia Working With China to Investigate Uyghur Terrorist SuspectA Second Look at the Bangkok BlastWhy Thailand Returned the UyghursMyanmar’s Ethnic Parliamentarians May Be 2016’s 'Kingmakers'Uyghur Terrorism: A Misnomer?